Before synthetic chemicals, natural ingredients were used to create colors and dyes for hair, makeup, clothing and food. 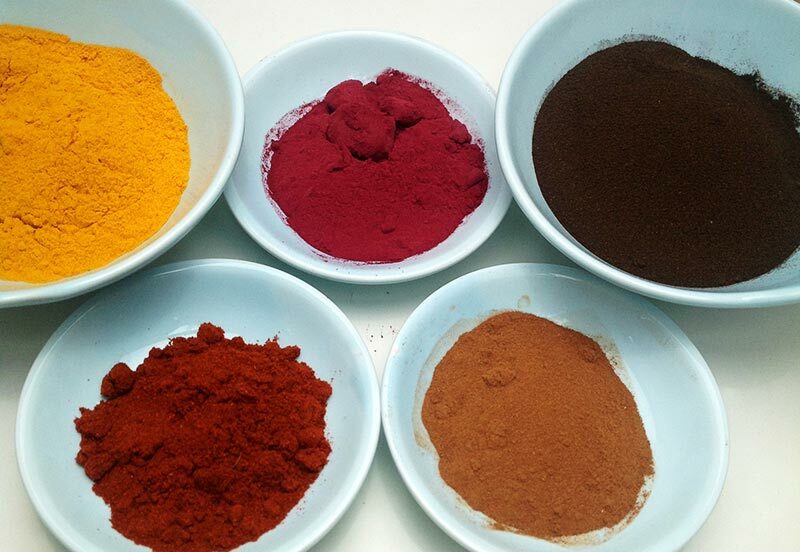 Brilliant yellows, blues and reds can be achieved with plant-based ingredients, and some techniques are up to 5,000 years old. These colors can be vivid or subtle, depending on the concentration of the solution used and the medium, or solvent. If you don’t have a bottle of turmeric in your kitchen, you are really missing out. Capsules of pure curcumin, turmeric’s valuable anti-inflammatory ingredient that causes it’s yellow hue, can run up to $26.99 for 60 capsules! Considering a whole pound of organic dried turmeric can cost that much and last for months of beauty and cooking applications, I would head straight to the bulk spice store and stock up. Turmeric can add lovely wheat tones to the hair when very diluted, all the way up to banana yellow when used in paste form. 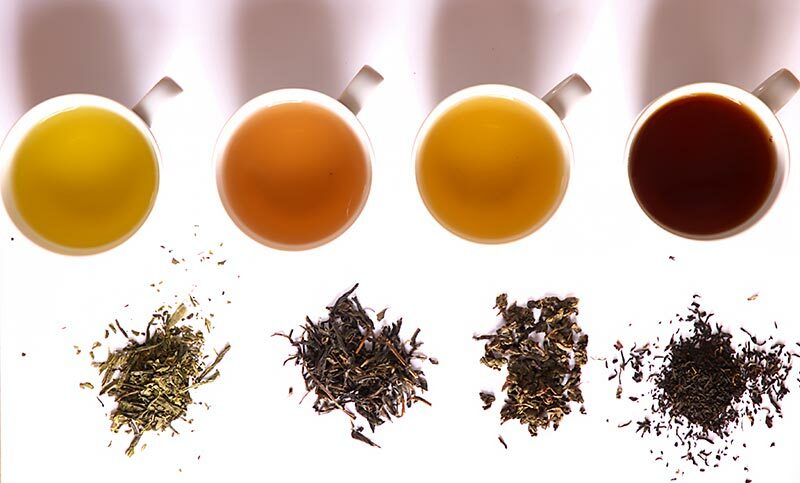 Coffee or black tea are also great sources of rich color. Though you could use either of these things to add shine and depth to different brunette shades, this is not recommended over blonde hair. 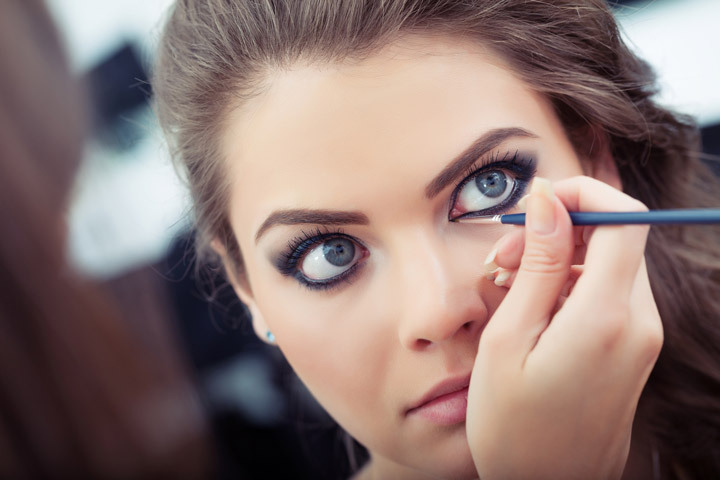 There is not enough pigment to saturate the cuticle of blonde hairs to make it brown, so it will look grayish and drab. 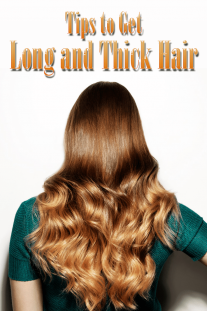 However, if you fall in the brunette category, super-strong black tea and coffee emulsions will add warmth to your color and their acidic nature will tighten the cuticle layer, smoothing strands to add intense shine and lessen tangles. Coffee will have a slightly cooler effect than tea, and will be a bit more opaque. Blondes or light-brown ladies have the lucky option of lightening many shades quickly with one natural ingredient: citrus. But the nice, subtle lightener that isn’t too acidic is chamomile tea. The effects aren’t dramatic, but if you need a little brightening, this is a lovely choice. It also smooths the hair strand and tones highlights. For those looking for something a little different, you can make a tea with beets and water, or you can use beetroot powder, which is just powdered beets. This will give light shades of hair a vibrant pink or red color (after all, beets are the secret to red velvet cake). A beet emulsion will make a reddish/pink cast on any hair color, with a brighter effect on light hair. These ingredients are affordable and abundant, and easy to mix up into a color treatment, and the procedure is shockingly simple: Hot water and material of choice! The way to achieve the intensity you want is by adjusting the strength of the solute (tea, coffee, powdered spices) in the solvent (water, oil, butters). 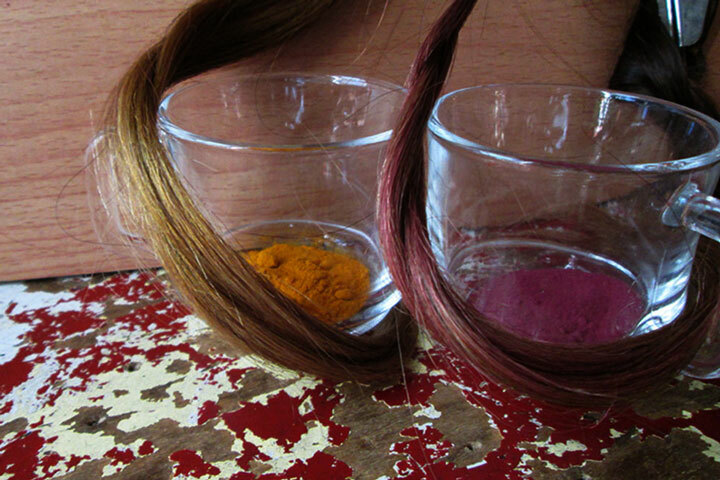 In this demonstration, I will only be using water, as some oils can activate the dyes of turmeric and beet too intensely for most hair applications. Turmeric is especially vibrant, and when mixed with oils can stain skin for weeks at a time! Most hair lengths will get away with using as little as 3 oz of water to saturate fully, but it is helpful to have extra to work with. I like to make enough tea to fill an 8 oz hair color bottle. For spices, 2 tsp of starting material would be adequate; for loose leaf teas and coffee, you can brew one serving in 8 oz of water for a subtle effect, or concentrate up to 10 servings per 8 oz for a more intense effect. These mixtures will be runny and watery, and you will want to make sure you don’t dribble all over the bathroom or kitchen. I usually prepare the solution, transfer to a bowl, let cool, and put down some dingy project towels in the bathroom and over the sink. Sometimes my entire tub is yellow from the rinses I do with turmeric. The best clean up method for these types of stains is to scrub in dish soap and allow to sit for an hour before rinsing and scrubbing with a sponge. These recipes are generally used to achieve an all-over hint of color, like a salon glossing, only far cheaper and temporary. If you are looking for a very intense result, make you emulsion stronger. You can always test it on a paper towel to see how bright the color will be. 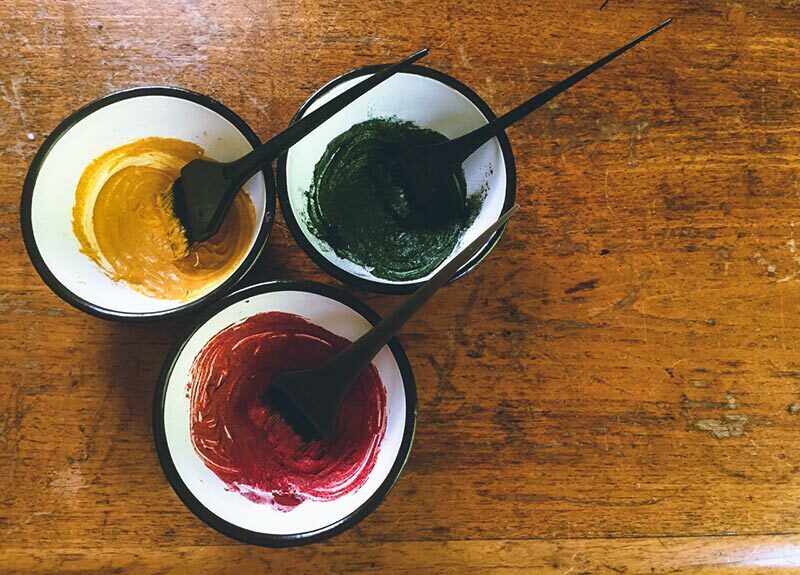 If you color your hair with permanent dye, you may want to check with a stylist before playing with anything other than tea or coffee, the dye molecules in turmeric and beets do not like to mix with chemicals. Brunettes can use the blonde formulas, blondes can only use the blonde formulas but will have extra-vibrant colors if the funky colors are used. Redheads can use the blonde formulas as well as the red vibrant formulas. Very dark brown hair can use any of the formulas, with the edgy formulas adding a translucent sheen. Highlighted hair will have a combined translucent effect on darker hair, and more vivid color on lightened pieces. Allow the mixture to cool down slightly and strain before putting in a plastic bottle or on your head. To apply, simply massage into clean, dry stands, little by little until desired area is fully saturated. Leave for about an hour, rinse and condition; do not shampoo, as this is a temporary rinse, and shampoo’s alkalinity will lift it right out of the cuticle!